“Post weld heat treatment” is what PWHT stands for. The ways and reason of this type of heat treatment procedure will be discussed in this article. The stress relief heat treatment procedures for welded joints are known as post weld heat treatment or PWHT. Before going for PWHT, you must understand that it incurs cost and it is not always necessary. By doing this heat treatment your aim is to minimize the potential hydrogen induced cracks (HIC). So, if there are no chances of HIC then it makes no sense of going for this costly process. If the welded joint falls in the red area of the above fig.1. , then there is chance that your joint may develop HIC. What does that mean? 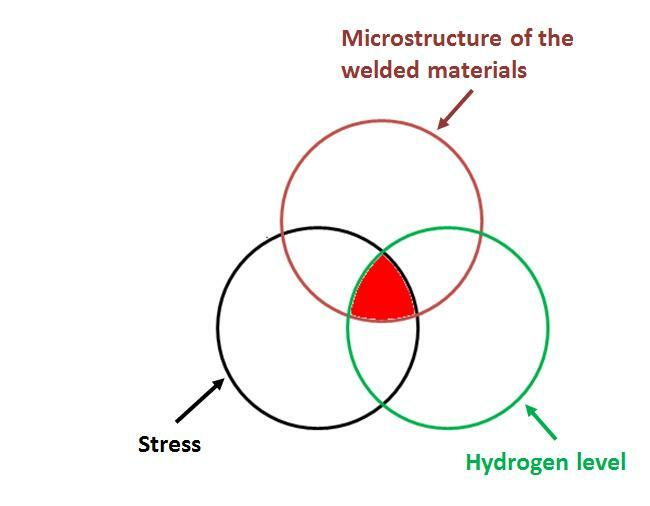 The microstructure of the joining material is sensitive to hydrogen, sufficient level of hydrogen and sufficiently high stress level; if all the three parameters are present in the weld joint then you should go for PWHT. How it helps reducing the HIC or hydrogen embrittlement? During the post weld heat treatment, the welded joint is kept at higher temperature for sufficiently longer period of time. The time and temperature should be sufficient enough to diffuse the most of the entrapped hydrogen from the joint. So, as there are no more hydrogen so no more HIC. Fixed furnace: These are very big furnaces fuelled either by gas or by electricity. The furnaces are fitted with rails. The work piece enters from one door and exit from the other. Capable of heating up to 1200 Degree C.
Temporary furnace: When work pieces are too big to carry and accommodate in a fixed furnace, this kind of temporary furnaces are built at the fabrication sites according to the size of work piece. Local heating: Work pieces with one or two long joints are heat treated by local heating by means of induction or resistance heating. Internal firing: The large vessel shape work pieces are suitable for this type of heat treatment. The inner diameter of the vessel should be large enough to accommodate the gas burners. The post weld heat treatment or PWHT can be done in many ways, the purpose is to keep the welded joint in elevated temperature sufficiently long enough so that no hydrogen induced crack developed after bringing the work piece to room temperature. Or, in other word this is the stress relief heat treatment for welded joint.